PERSIAN GULF (Jan. 24, 2008) The British destroyer HMS Manchester (D 95) sails beside the Nimitz-class aircraft carrier USS Harry S. Truman (CVN 75). Truman and embarked Carrier Air Wing (CVW) 3 are on deployment in support of maritime security operations. The Royal Navy Type 42 destroyer HMS York is set to sail on into the 21st Century thanks to a £17m maintenance contract with Portsmouth based Fleet Support Limited. 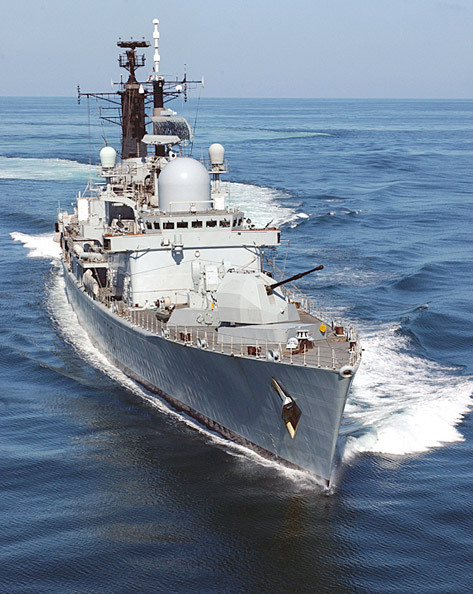 Work scheduled for the warship's upkeep includes maintenance of the Sea Dart missile launcher to sustain Air Defence Systems, improvements to the ship's fuel efficiency, and the upgrading of the galley and domestic equipment to improve living conditions for personnel serving onboard. One of the major tasks of the ship's refit will include the running of miles of cabling throughout the vessel for rewiring the ship's communication systems and the installation of a new IT network. The ship's interior accommodation and crew facilities will also see improvements. "A vibrant shipbuilding industry is essential to the UK. This is important for contracts for new powerful ships and the vital maintenance and upkeep work to our existing fleet. "This £17 million contract to Fleet Support Limited is excellent news for Portsmouth and will ensure HMS York remains capable of playing a valuable front line role in future operations." 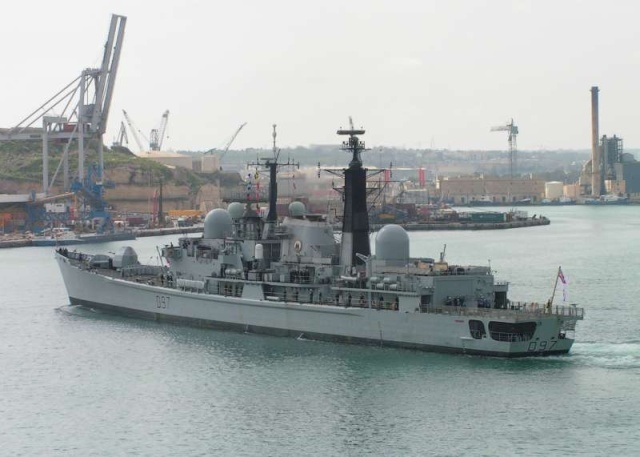 HMS York is the first refit of 2008 for Fleet Support Limited. Work on the ship has already started and is due for completion in 2009. 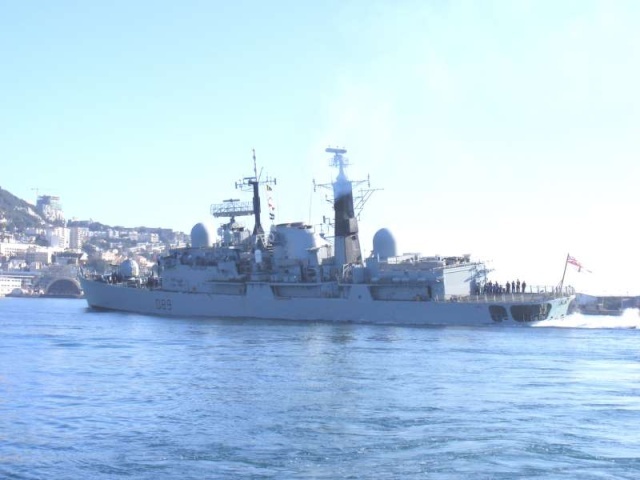 HMS Exeter, the Portsmouth based Type 42 Destroyer, sailed from Monte Carlo having completed a hugely successful informal visit to the Principality. The first visit by a British warship of her size in over 17 years, the ship hosted a Commanding Officer’s lunch and Official Reception, whilst receiving the most extensive local hospitality by British residents in most sailor’s memories. HMS Exeter made an initial visit to Villefranche-Sur-Mer, an idealic French town a few miles West of Monaco in France. Whilst moored to the buoy in the centre of the sheltered bay, the CO was able to make his official calls in Monte Carlo, including visiting the Royal Palace and signing the Prince’s visitors book. 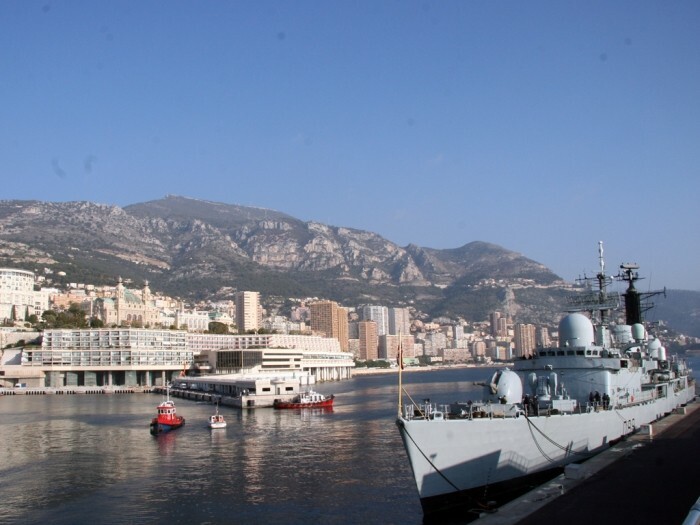 The short passage from Villefranche-Sur-Mer to Monte Carlo provided the rare opportunity to embark prominent members of the Monaco local community and demonstrate HMS Exeter’s capability, also giving an insight to life on board a Royal Navy destroyer. Immediately re-rolling to entertain over 120 guests at the Official Reception the same day, the backdrop of Monte Carlo provided a glamorous setting for the occasion. 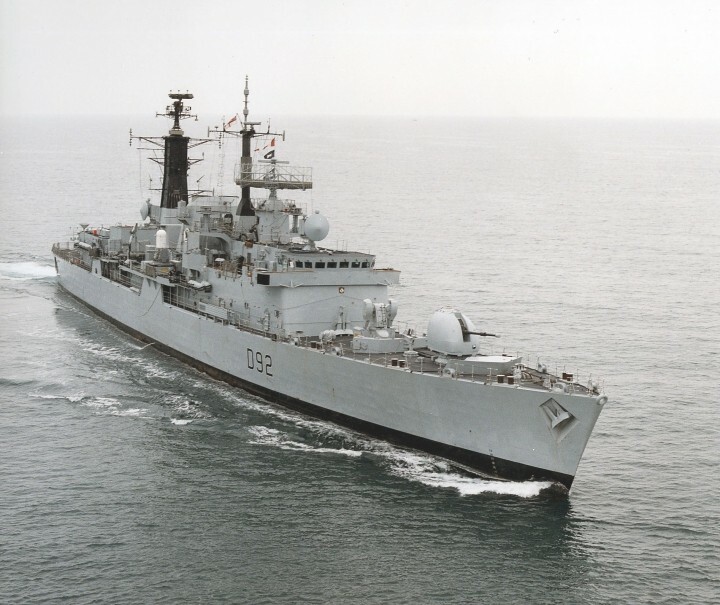 The Commanding Officer, Commander Paul Brown, first visited the Principality as a young Midshipman serving on board HMS Minerva in Oct 1990. Commanding the first British destroyer ever to visit, he exclaimed, “It is a real privilege to return to Monte Carlo and I’m particularly proud to do so in HMS Exeter”. The Ship’s Company received an overwhelming welcome by residents of Monte Carlo. Over 30 sailors in their Nos 1s toured the Formula One circuit in Porsches, a Jaguar XKR and Bentley. Whilst no track records were set, the volunteers found the experience exhilarating, taking in such land marks as the Casino Royale and the famous F1 tunnel. Others viewed the large Mega-Yacht Rio Rita, enjoyed an invitation by the City Mayor to the Flower Festival Carnival in Nice and took up tens of personal extensions of hospitality by British residents. 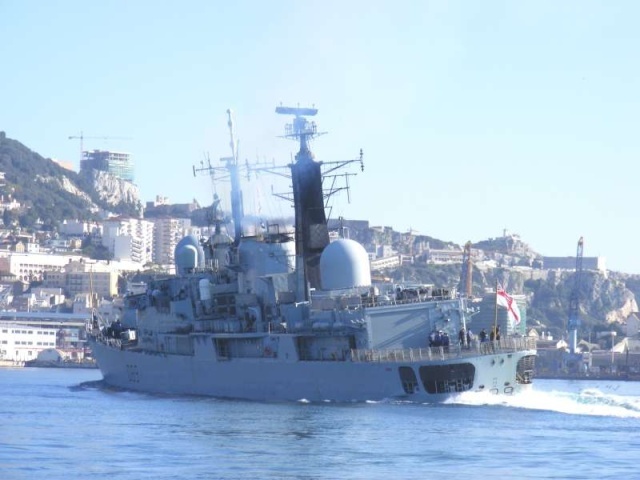 HMS Exeter, the oldest general service warship in the Fleet and the sole survivor of the Falklands War, departs Monaco to resume participation in the NATO led Operation Active Endeavour in the Mediterranean. Nottingham has spent the last few weeks on patrol in the South Atlantic. We are now 4 months into our 6 month Atlantic Patrol Tasking (South) deployment. During our recent visit to East Falkland we were visited by several VIPs. Commander-in-Chief Fleet, Admiral Sir Mark Stanhope KCB OBE Royal Navy; UK National Hydrographer, Rear-Admiral Ian Moncrieff Royal Navy and Commodore Portsmouth Flotilla, Commodore Andrew Cameron Royal Navy, all came on board Nottingham for dinner and also a chat with members of the Ship’s Company. On the social front, the Ship’s Band gave an absolutely fabulous concert in the Officer’s Mess at Mount Pleasant Airfield (MPA), the near-by RAF base. From a sporting perspective the Marine Engineering Department took on the Ship’s Veteran football team this week. The veterans were eventually victorious in a closely fought 5-3 encounter. Also, a group of Nottingham Ship’s Company visited the Military dog section at MPA. The RAF Dog Section is permanently based in the Falklands. They hold 12 dogs which are used for patrols, land searches, explosive searches and search and rescue. Each dog has its own RAF Police handler who alternate on a four monthly basis from the UK. 11 members of the ships company attended a dog handling introduction in which they learned about the roles the dogs carry out. Each person then dressed up in a protective suit and acted out a threatening scenario towards the handler, at which point they would release their dog to demonstrate how they are trained to subdue an offender. The ship’s company were able to see how a handler and their dog would react to a difficult situation and also how it feels to be on the wrong side of a trained police dog! HMS Southampton (D 90) departing from Portsmouth Naval Base on the 25th February 2008. HMS Edinburgh (D97) escorting HMS Illustrious on a visit to Malta on 26/02/2008. 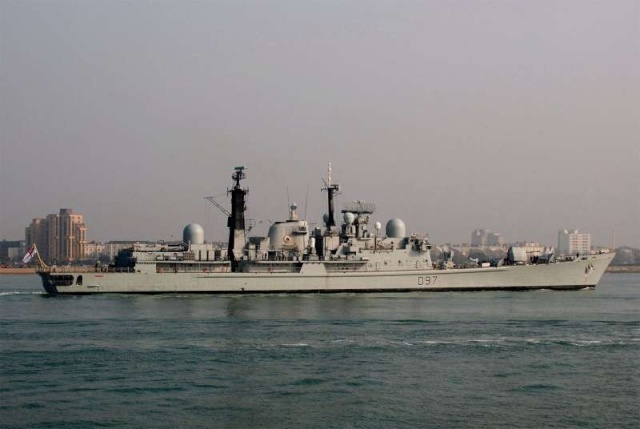 The warship HMS Southampton will visit the city of Southampton between 3-5 March 2008. A Type 42 air defence destroyer, she arrives in Southampton as part of her continuing relationship with her affiliated city. During her short stay she will host representatives from many of her affiliate organisations, including sea cadet and sea scout groups. Deployed for the majority of last year around South America and in the South Atlantic, Southampton returned to the UK in December to a warm and emotional welcome home. Having subsequently undergone a routine maintenance period the ship is once more at sea, this time operating in the English Channel. HMS Southampton was last in Southampton in December 2006, when the ship’s company enjoyed a highly successful visit, the highlight being an official reception on board. 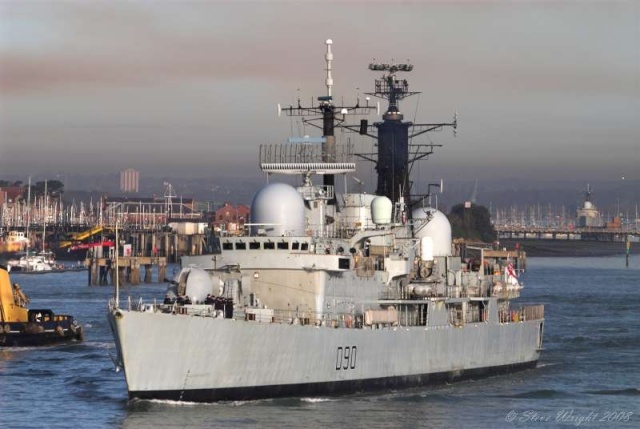 Royal Navy warship HMS Liverpool will anchor in the approaches to St Peter Port this weekend (29 February – 2 March 2008) for a three day visit as part of her sea safety training. Under the watchful eye of the Navy’s Flag Officer Sea Training (FOST) staff, every aspect of Liverpool’s procedures and routines will be scrutinised over Saturday and Sunday. The Type 42 destroyer will be judged on her performance handling a real life series of public events, including entertaining local civic dignitaries and hosting capability and resilience demonstrations. The aim of the capability demonstration is to both entertain and educate. Traditional Naval hospitality is combined with a ship’s tour which involves a series of “live” stances telling an operational story, for example boarding a suspect vessel in a high threat environment and explaining the ship’s role and procedures in carrying out this mission. 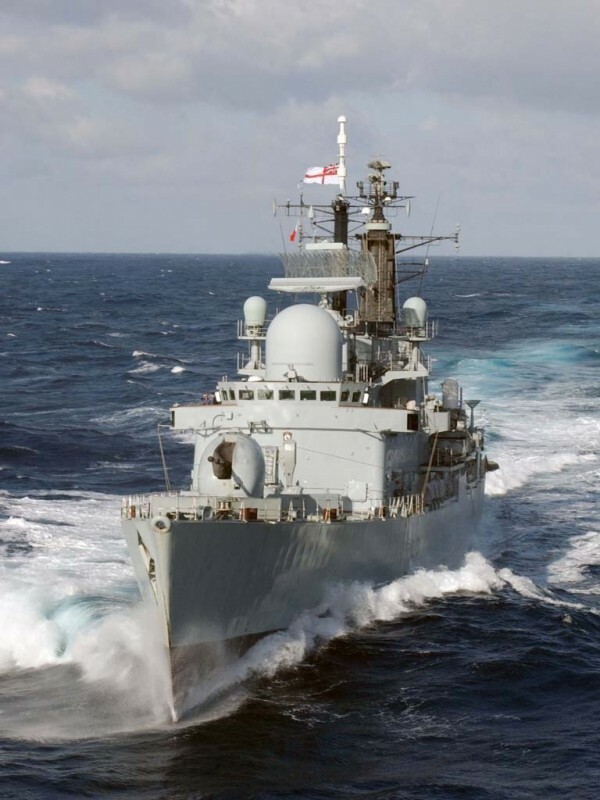 HMS Liverpool will also take the opportunity to demonstrate the contribution the Royal Navy could make in the event of a large scale incident or emergency in the region that would require cooperation from a number of different civil and military organisations. Members of the Jersey Resilience Community will receive briefs from Lieutenant Colonel Christopher Price of 43 Wessex Brigade, and Commander Tom Herman, Deputy Naval Regional Commander as well as a live demonstration. The ship can act as a multi agency headquarters with an Operations Room which can be used for surveillance and force protection, and offers a range of other services, including first aid, engineering support, aviation support, logistical and disaster relief expertise. 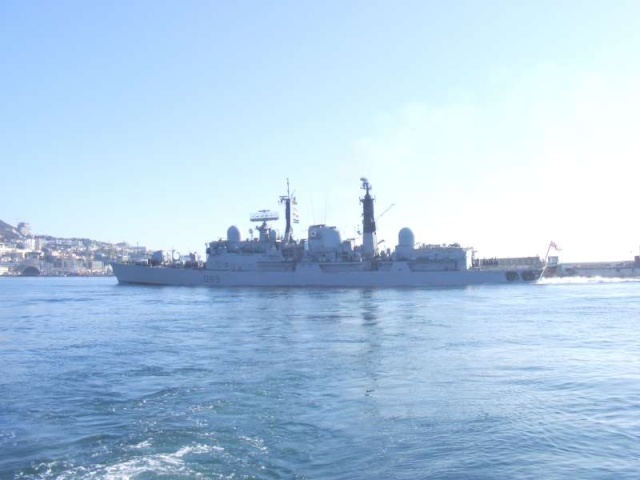 The Commanding Officer of HMS Liverpool, Commander Craig Wood, said: “This visit to Guernsey is an essential element of the meticulous preparations for our forthcoming deployment to the South Atlantic, and comes on the back of an intensive two months of operational training in the south west exercise areas. HMS Liverpool is the tenth of the class of Type 42 destroyers and the seventh ship to bear the name. She was built by Cammell Laird of Birkenhead and was launched on 25 September 1980 by Lady Strathcona, wife of the then Minister of State for Defence. 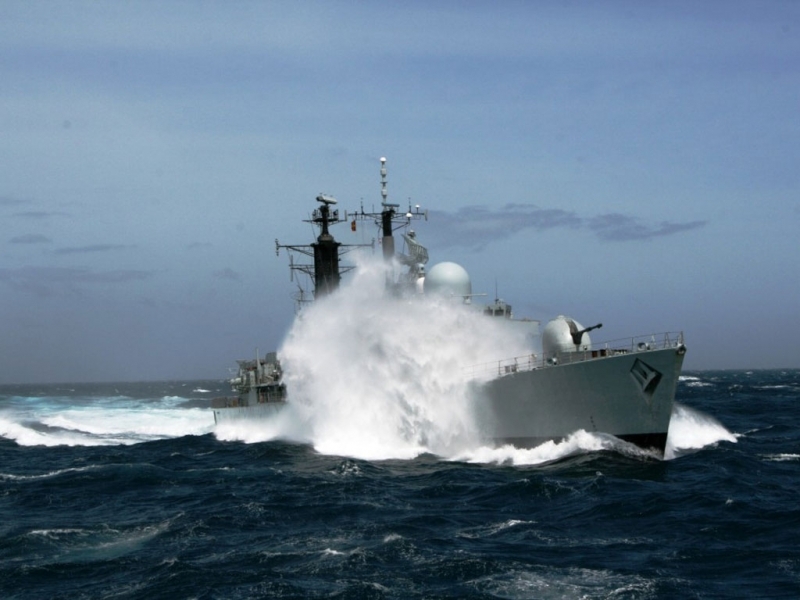 Type 42 destroyers are equipped with the Sea Dart medium range air defence missile system, which in its primary role is designed to provide area air defence to a group of ships, although it is also effective against surface targets at sea. 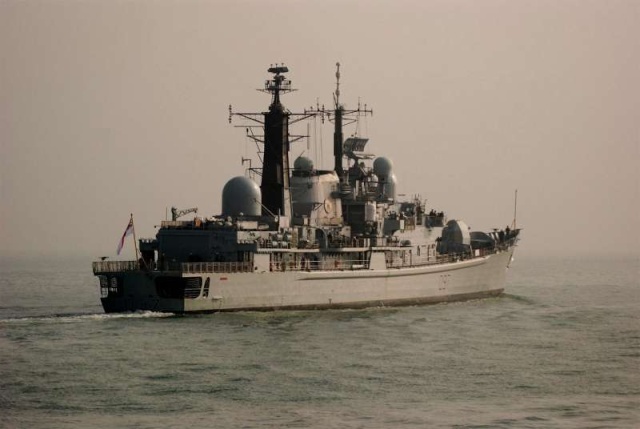 In addition to their role as an air defence platform the Type 42 destroyers operate independently carrying out patrol and boarding operations, recently enforcing UN embargoes in the Gulf and the Adriatic as well as providing humanitarian assistance in Monserrat and East Timor. Over the past week Nottingham has visited the Antarctic, spending 3 days in the vicinity of one of Britain’s most Southerly Dependencies: South Georgia. Initially we had the opportunity to sail around several of the many bays on the Northern Coast of South Georgia to observe the Glaciers and mountain ranges, the scenery was fantastic! When we entered Royal Bay we were lucky to see some beautiful Ice formations, as well as a huge colony of King Penguins living on the Beach there. In South Georgia’s surrounding waters we encountered many icebergs, the largest of which were almost a mile long. Having successfully avoided these monsters, we proceeded to anchor off King Edward Point, in Cumberland Bay, which is home to the British Antarctic Survey (BAS) and an old Whaling Station nearby at Grytviken. During our 2 days at anchor, the majority of the Ship’s company made it ashore. In Grytviken there is a small museum that commemorates the whaling and sealing trade that was popular in the region during the 19th and 20th centuries. South Georgia is also famous as the burial place of Sir Ernest Shackleton, the famous explorer, who died there in 1922. The museum dedicates a large portion of its exhibits to Shackleton’s exploits, particularly his famous attempt to cross Antarctica in 1914. The expedition almost ended in disaster when his Ship Endurance became trapped in ice and sank. Shackleton and 2 others made a famous voyage to South Georgia from Antarctica, on board a small lifeboat, and then crossed South Georgian mountains and Glaciers, from the South, in order to find help and ultimately save his entire party of 24 people. Along with its historical significance, South Georgia is also home to an abundant range of wildlife, including: Seals, Penguins, Albatross and many other types of Bird. The landscape and scenery were breath taking, and everyone on board Nottingham thoroughly enjoyed the rare opportunity to visit such a remote and beautiful Island. Having spent the best part of three months in cooler climes, HMS Nottingham headed North this week, in company with RFA Gold Rover. 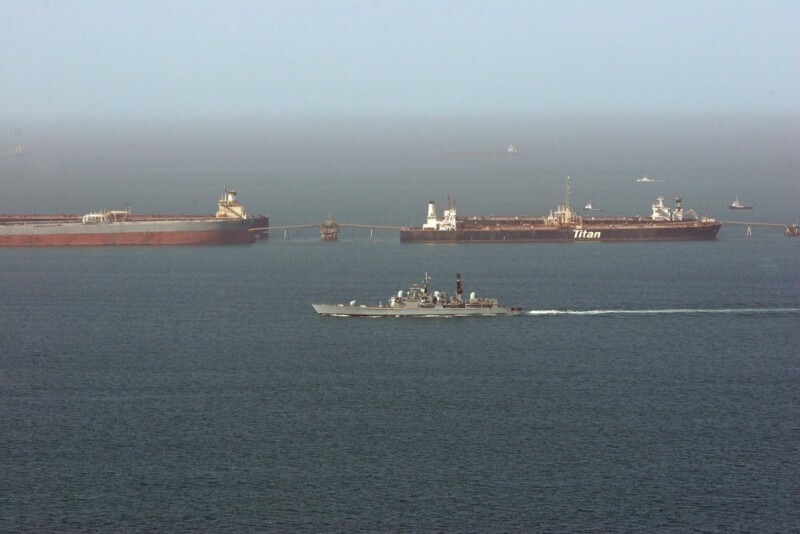 The presence of Gold Rover means that Nottingham can spend longer at sea and extend our range of operations, by replenishing whilst underway. 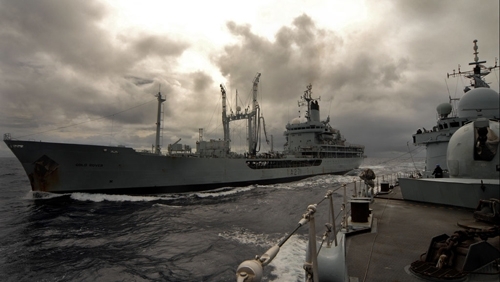 The RN and RFA have several different methods of transferring cargo, fuel or even personnel whilst underway, known as RASing (Replenishment At Sea). The most commonly used ‘abeam’ methods involve the two vessels steaming alongside each other at a range of between 30 and 45 m, and then passing a transfer line, or ‘Jackstay.’ Once the jackstay is in place it can be used for transferring loads between the two ships or, as in our case this week, for supporting the weight of a fuel hose. This week Nottingham conducted 2 abeam RAS (Fuel) serials, during which we received in excess of 500 cubic tonnes of Fuel from Gold Rover. Enough to power the average car for around 7 million miles! Nottingham also took part in the ‘BBC Sport Relief Mile’ this week, when the Ship’s Company got dressed up in red and ran a mile (roughly 7 laps) round the upper deck. The event raised over £200 for Comic Relief and a good time was had by all. On reaching warmer waters, where temperatures topped 30ºC, the ocean began to look more and more inviting. What better time then to conduct Swimmer-of-the-watch training. The RN has several approved methods of recovering a man over board, one of which is to position the ship close to the person, and then send a willing volunteer into the sea to rescue them. Not wanting just the swimmer to have all the fun, the Commanding Officer approved a ‘Hands-to-Bathe.’ Hands to Bathe is a traditional Naval serial in which the Ship is stopped in the water and all those that want to can jump over the side and have a swim. The water was beautiful and the experience most refreshing! 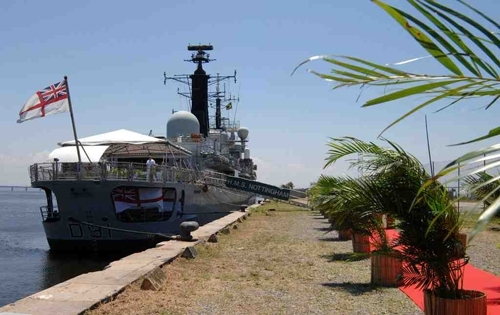 HMS Nottingham recently found herself flying the flag in Rio de Janeiro, Brazil. The Royal Navy Type 42’s visit coincided with the 200th anniversary of the Portuguese Royal Court’s landing in Rio de Janeiro. In November 1807, as Napoleon’s French army supported by the Spanish overran Portugal, the Royal Family’s position became untenable. Their only option for escape was to embark on a large scale evacuation. Over the next 4 months more than 12000 Portuguese, mainly comprising the court of the Prince Regent d. Joao, fled to Brazil. As well as Portuguese Warships and British merchantmen, Royal Navy Warships were involved in the operation that culminated in the Prince Regent landing in Rio de Janeiro on the 7th March 1808. Nottingham commemorated the event by hosting an official reception whilst alongside in Rio. More than 100 people attended including UK Minister Dr Kim Howells MP, UK Ambassador Peter Collecott, and the Commander-in-Chief of the Brazilian Navy. Furthermore, the function was attended by representatives from the British community in Brazil, local government authorities, other senior naval figures, businessmen and members of the local community. The day was a resounding success, allowing the visitors to see a modern Warship up close, and to meet members of her crew, whilst commemorating the historical relevance of the occasion. Having enjoyed some well earned R&R alongside in Rio, Nottingham proceeded to sea this week in company with the Brazilian Naval Ship Niteroi and Royal Fleet Auxilliary Gold Rover. The 3 ships conducted a Passage Exercise (PASSEX) in which they participated in a variety of ‘combined’ training serials. “Officer of the Watch Manoeuvres” as we call it, involves ships manoeuvring in close proximity, turning the ships together, or in sequence, and adopting a variety of formations. We also practiced Replenishment-at-Sea approaches, where one ship closes another so as to pass lines for transferring cargo or fuel. The aviators got in on the act as well, when Nottingham’s Lynx Mk 3 Helicopter conducted some formation flying with Niteroi’s Super Lynx. During the 36 hr PASSEX it was possible for members of each Ship’s Company to cross over onto the ships in company by Helicopter or sea boat transfers. This allowed several RN and BN personnel to experience life on the other side. Nottingham is now back at sea, on passage with Gold Rover, conducting Maritime Security Operations. 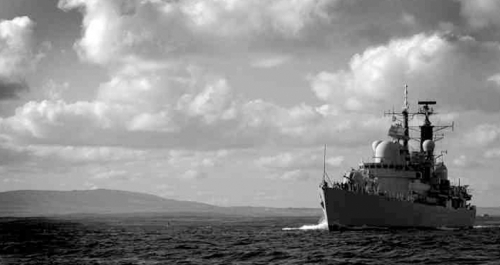 The last month has been a tale of two halves for the men and women of HMS Manchester. The first half was spent alongside in Abu Dhabi, conducting important planned maintenance and recharging the crews batteries, whilst the second was spent back on patrol in the Persian Gulf. 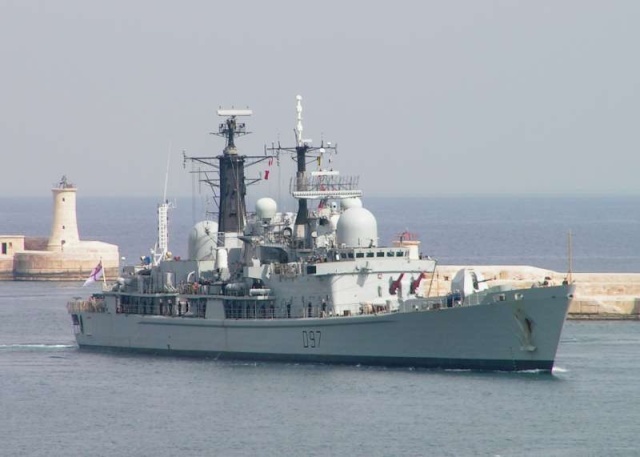 On Saturday 1st March HMS Manchester berthed in Port Zayed, Abu Dhabi for her mid-deployment Self-Maintenance Period (SMP). Port Zayed is a brand new berth and so it was an interesting bit of pilotage for the Bridge Team as the Port does not yet appear on Admiralty Charts! Despite a busy maintenance schedule time was ring fenced for the Ship’s Company to get some valuable and well deserved rest and recuperation (R&R) after a prolonged period of operations. The engineers started work on day one, carrying out the all-important maintenance that is often difficult to conduct at sea whilst the machinery is running and weapons and sensors are at high readiness. The 909 Radar team worked around the clock to rectify a defect on one of the Radars and restore full combat capability. Maintenance of the Upperdeck was at the forefront of the Warfare Department’s mind; the ship has taken a battering since we left Portsmouth in November. The whole of the Upperdeck received a fresh water wash down to remove all of the sand deposited on the ship after the sand storms we had sailed through and plenty of hours were put in preserving the superstructure, fittings and fixtures. It was a busy time for the Logistics department too, with a large amount of both Naval Stores and Provisions arriving by the truckload on a daily basis. We had packed three large sea freight containers before we left Portsmouth with items that would be required during the SMP and in the second half of the deployment; these met us on arrival in Abu Dhabi. The Manchester boys came away with a 5-0 win in this comprehensive victory. It was the first time the lads had played together since Bahrain but it didn’t show as the team put in their best performance of the deployment so far. A tough game for the Manchester team against a squad of players who had just reached the Gulf Cup semi-finals. The Abu Dhabi side fielded a full strength team for the first half and they showed their class, scoring try after try. The second half was a lot more competitive after Abu Dhabi made some changes to their side. A number of members of the Ship’s Company were privileged to play at the Abu Dhabi National. The course had recently hosted the European PGA Tour and was described as a green oasis surrounded by the desert. Manchester’s Cricket Team took on a strong team in conditions that were less than ideal. A concrete wicket surrounded by sand was something that the team was not familiar with. With the playing conditions strongly in the host’s favour, Manchester lost the match by five wickets. During the second week alongside HMS Manchester hosted an Official Reception which was attended by Sir John Major and a number of local dignitaries from Abu Dhabi. The weather was fantastic and the Stewarding Team did a fantastic job during the Reception. The evening ended with Ceremonial Sunset which was perfectly executed by the guard. The Reception was also attended by three Officers from our affiliated Army Regiment, 1st Lancashire King’s Regiment who took the opportunity to visit us from Basra where they are currently engaged on Operations. With the SMP completed Manchester moved into the final third of her deployment. For the first time, Manchester conducted security operations to protect the Iraqi Oil Platforms in the Northern Arabian Gulf. These Oil Platforms are highly valuable and consequently they are targets for insurgents and terrorist organisations. Manchester patrolled the area around the Oil Platforms ensuring that only those vessels with permission came anywhere near them. 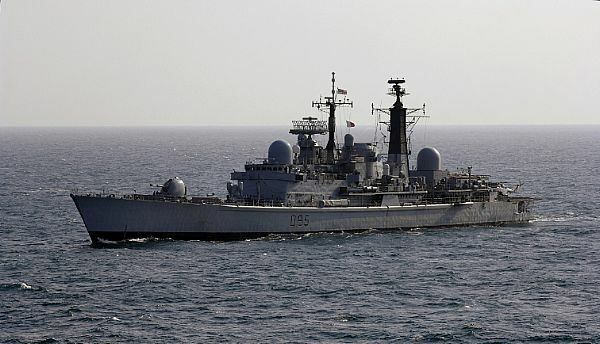 Interestingly this was the first time that a Type 42 has operated in Iraqi Territorial Waters since the last Gulf War. The end of the was spent conducting Maritime Security Operations in the Central Arabian Gulf. The objective of these operations is to provide a presence in the area to deter illegal maritime activity and to reassure the legitimate maritime community that they can go about their business in safety. The period has included a large number of AAVs where we have passed on vital information to many fishing dhows in the region and sought intelligence regarding piracy and terrorism. The Masters of the vessels normally welcome talks with our sailors and are happy to co-operate and pass us information. We provide them contact details so that they can call for assistance if required. As you read this article Manchester remains on task in the Arabian Gulf ready to meet the challenges that are sure to present themselves in April. A seven-month deployment to the South Atlantic will get off to a flying start for the warship HMS Liverpool when an RAF Tornado jet gives her a dramatic send-off from her Portsmouth base tomorrow (Wednesday, April 2). The Tornado, from Liverpool’s affiliated RAF Squadron – No. 12 – will provide the parting salute during a routine training flight from its base at Lossiemouth, Scotland. Liverpool, a Type 42 destroyer, will fulfil multiple roles as she patrols as far south as the Falkland Islands and as far north as the coast of West Africa. As well as providing the maritime security that ensures world trade, she will form the maritime element in defence of the Falkland Islands and further north will contribute to the fight against international drugs smuggling. Her mission to help make the world a safer place will also include the Royal Navy’s traditional readiness to provide humanitarian aid to people in trouble, particularly in the face of the natural disasters that bedevil the globe. 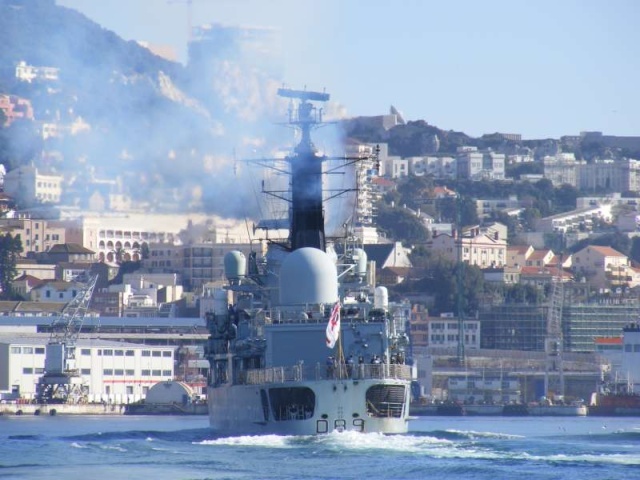 And as an extension of Britain’s diplomacy in the region she will demonstrate the Royal Navy’s global reach, flying the flag during visits across three continents, including ports in Portugal, Brazil, South Africa, Angola, Ghana, Sierra Leone and Senegal. The ship’s Commanding Officer, Commander Craig Wood, said today: “HMS Liverpool is deploying to the Atlantic region to safeguard British interests by conducting maritime security, reassurance and deterrence of illegal activity.